- This is the training equipment build exclusively for Triathletes because you can bring it to your swim sessions without being afraid the water might get in. Water resistant up to 50m. - Swim-Bike-Run transitions in a few seconds. From your wrist to your bike and then back to wrist for your final run in a few seconds. - Upload your training data wirelessly to your computer. - 20 hours of battery - longer than before. cool... need to get me one of those..
What a fantastic gadget.!! 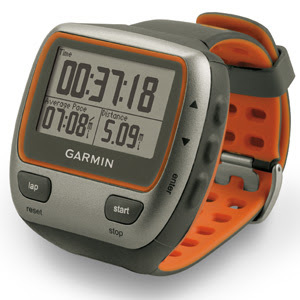 I can't wait to get a Garmin Forerunner 310XT GPS triathlon watch.